A chronological journey through the history of puppet theater in Puerto Rico that brings to life the work of many of the region’s prominent puppet masters. Directed by Manuel Antonio Morán and Kristian Otero. 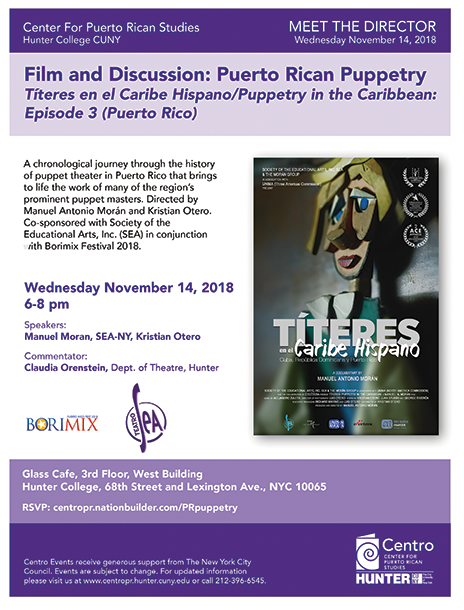 Co-sponsored with Society of the Educational Arts, Inc. (SEA) in conjunction with Borimix Festival 2018. Glass Cafe, West Building, 3rd Floor, Hunter College at 68th Street and Lexington Ave.